At Blue Star Direct, we’re proud to support Very Special Kids (VSK). They’re a not-for-profit organisation that provide counselling and support services to families of children diagnosed with a life-threatening condition. VSK was established in 1985, after two families going through this experience, recognised the need for support. VSK currently work with over 850 families across Victoria – providing respite care, sibling and parental support, end of life care and ongoing bereavement support. Very Special Kids, relies heavily on community support, fundraising and donations. Blue Star Direct worked with VSK on their most recent Christmas Appeal DM and will continue to work with the organisation on their Appeal mailings throughout the year. We’re especially proud to help out with VSK’s fund raising efforts. Blue Star Direct Chief Operating Officer Brent McCulloch recently helped to raise $850 by dressing up for the cause and encouraging Blue Star Direct employees to donate. 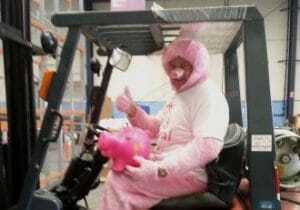 Brent sported a piggy outfit for an entire day to help raise funds for the piggy bank appeal. If you’d like to support this very worthy cause please visit their website to find out how http://www.vsk.org.au/ or call Addy Wetzler, Corporate and Community Fundraising on 03 9804 6227.